To lose weight, you have to reduce your calorie intake and undertake regular exercise. However, calorie reduction should not consist of starving yourself and depriving your body of energy and valuable nutrients. Exercise should not be excessive, but tailored to burn calories and increase your metabolism to help ensure weight loss is successful and permanent. Your body needs energy and nutrients from food to function optimally and to power your daily activities. When your body is starved of food, your metabolism slows down to conserve energy. Your body will not use excess fat for energy, but will cannibalize lean muscle tissue for its energy needs. A slower metabolism results in your body storing more fat. Loss of muscle tissue will further depress your metabolism. The result is minimal weight loss. Ensure you eat breakfast. 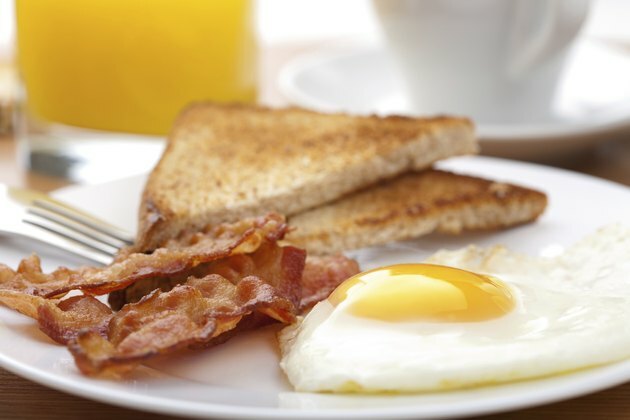 Breakfast provides valuable energy for your first few hours of activity in the day and kick starts your metabolism after an approximately eight-hour fast during sleep. Eat frequent small meals during the day. This equates to five to six meals in a day. Your body uses energy to assimilate and metabolize each meal. This will boost your metabolism. Limit your carbohydrate intake to one or two meals a day. Avoid simple carbohydrates such as white bread, white rice, candy, muffins, doughnuts, chips, French fries and cakes. Avoid sodas and alcohol. Eat complex carbs such as oatmeal, whole-grain rice, quinoa, sweet potatoes and yams. Eat plenty of fruits and vegetables. Replace your carbohydrate meals with fruits and vegetables. They are filling and nutritious and low in calories. 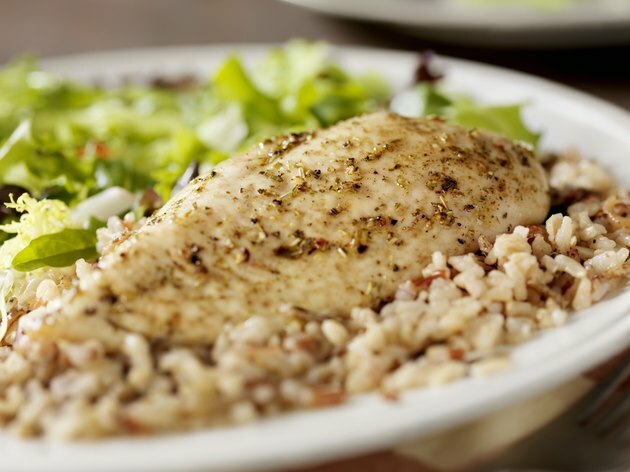 Eat protein with each meal to help maintain lean muscle tissue. Your protein should include lean cuts of meat and poultry, fresh fish, whole eggs, beans, legumes and lentils. Do cardiovascular exercise three to five times a week. Cardio exercise burns calories and uses fat as energy. Examples of cardiovascular exercise include running, jogging, bicycling, swimming, hiking and brisk walking. 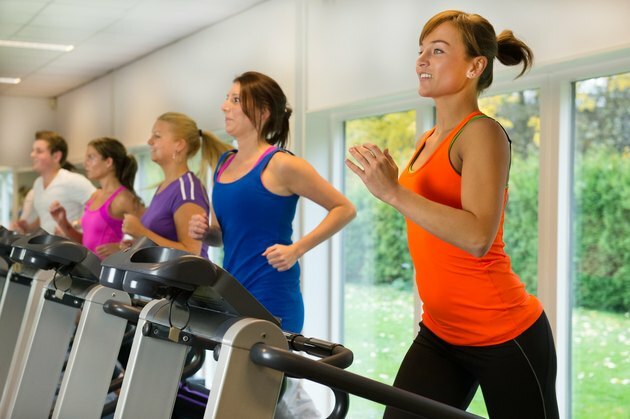 Alternatively, use cardiovascular equipment in a gym, such as the treadmill, stair climber, elliptical machine, stationary bike or rowing machine. To use fat as energy, cardio exercise should be at least 20 minutes in duration. For ideal fat loss, exercise between 50 and 85 percent of your maximum heart rate. This rate is based on your age and ensures you're making the most of your workout. Strength-training exercises will help you increase and maintain lean muscle tissue. Lean muscle tissue helps elevate your metabolism. A high metabolism helps your body burn fat more efficiently, ensuring steady and long-term weight loss. Use a combination of resistance machines and free weights in a gym and focus on exercises, which target your main muscle groups. These include your chest, shoulders, back, legs, gluteals and hips. Do strength-training exercises two or three times a week.